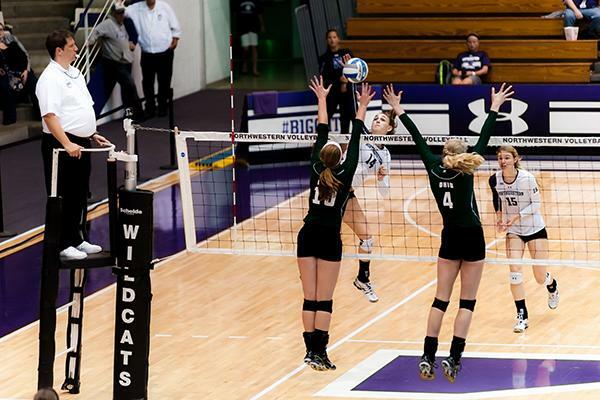 Senior Katie Dutchman slams the ball over the net in Northwestern’s Thursday night match with Ohio. Dutchman hopes to carry the Wildcats to the NCAA Tournament, after the team just missed out last year. Northwestern (9-1) began the Wildcat Challenge on Thursday, defeating the Ohio University Bobcats (6-4) three sets to two. Ohio came into the match winning their last five matches, including a win against Big Ten opponent Ohio State. The match was a cat fight from the start, as the Wildcats and Bobcats traded points back and forth in the first set, with neither team ever gaining more than a three point lead. The Wildcats began to pull away halfway through the set after a big block by Katie Dutchman in the middle that forced the Bobcats to call a timeout to try to stop the momentum. The Bobcats fought back, eventually taking a 23-22 lead, but the Wildcats outscored the Bobcats 4-1, taking the first set 26-24. Ohio did not seem too rattled after the first set, coming out early in the second set taking a commanding lead. A late push led by senior Yewande Akanbi was not enough to overcome the wide margin, and the Wildcats dropped the second set 22-25. Senior Monica McGreal’s two aces, along with two kills by freshman Symone Abbott, helped Northwestern get back on track in the third set. The Wildcats took control, but the Bobcats would not go away easily. The Cats eventually pulled away, winning another close set 25-21. The intensity increased in the fourth set. The Cats remained in control until the Bobcats finished off the set with 5 unanswered points, stunning the Cats 20-25. The fifth and deciding set was much like the first four, with both teams scratching for every point. Neither team let up, and the cardiac Cats won the fifth set 17-15. The win was the Cats’ ninth win in 10 matches this season. NU opened the season at the NIU Invitational on the road in nearby DeKalb, Illinois. The first match of the season was a thrilling come-from-behind win over Colorado. The huge victory carried over to the rest of the tournament, which they won by winning the next two matches in straight sets. NU added two more victories in the USD-SDSU Challenge in San Diego before finally being brought down by host of the tournament, then 15th-ranked San Diego. The Cats quickly bounced back from the loss by coming home and winning the Wildcat Classic, easily beating Youngstown State, Loyola and Virginia. The Wildcats are currently ranked 12th in the nation for hitting percentage and 40th in kills per set. Based on their early season play, NU appears a candidate to reach the NCAA tourney this year, after falling just short in 2013. This will not be an easy task after losing All-American Stephanie Holthus, NU’s all-time leader with 1,797 kills. In the first 10 matches, this growth was seen in the stellar play of a few individuals, especially Dutchman and Akabi. Additionally, Abbott was named Big Ten Freshman of the Week and Caroline Niedospial was named Big Ten Player of the Week. Next up for the Cats is a matchup against Green Bay on Sunday. This is the final nonconference match before Northwestern opens Big Ten conference play.